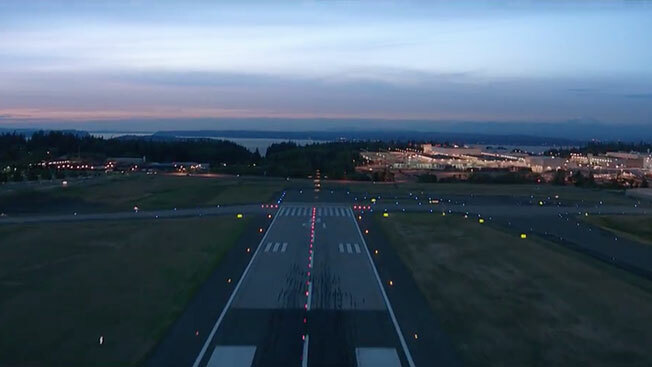 This new Delta commercial from Wieden + Kennedy in New York spends 45 of its 60 seconds staring at the ground, yet it's the most high-concept airline ad in a while. It's also either quite inspiring or a bit dismaying, depending on your level of comfort with airline ads that focus on the actual terrifying physics of giant machines hurtling along at great speeds. It aims for the former, naturally, but leans toward the latter at the outset, as Donald Sutherland intones, in a gravelly voiceover, "What's happening here is not normal." That's a bit of a funny line to open an airline commercial, even if Sutherland quickly follows it up with the disclaimer, "It's extraordinary." And the rest of the poetic voiceover—combined with visuals that are hectic and claustrophobic until almost the very end—doesn't exactly lighten the mood. Later, in another part of the voiceover, Sutherland takes stock of a Delta jet furiously in motion—"291 people, 350 tons, 186 miles per hour"—and then suggests, bluntly, "There is no stop in us. Or you. Only go." That's meant to be a good thing, though it risks conjuring imagery of not being able to stop—and might have you pining for one of W+K's famously inventive safety videos for the same carrier. As a grandiose mini manifesto, though, it works well enough—saluting Delta's indomitable spirit and its passengers' sense of adventure. And if it overreaches here and there—e.g., comparing today's travelers to "the pioneers … in canoes and covered wagons, with wild eyes and big-fevered dreams"—it sure beats focusing on the reality of today's air travel. The visual approach is pretty brave, too, and unique—not showing a single airplane—even if it's not totally clear why it took two directors (Smuggler's Adam Berg and Joost Van Gelder) to shoot it. The first half of the spot almost evokes space travel, as the close-up of the runway lines flying by gives a sense of lifting. The final shot is lovely, too, bringing a calmness to what's been a bit of a bumpy ride. The sound is notable, as well—a deep roar that pulsates more and more quickly as the plane gathers speed, making the spot even more intense (which is plenty engaging, though for the reasons mentioned above, doesn't always feel entirely pleasant). This work is part of the "Keep Climbing" campaign but takes a slightly new direction to show how Delta enables the pursuit of opportunity, connecting flyers to great experiences, adventures and opportunities in the world. Just, you know, buckle your seatbelt first, and be willing to help in case of an emergency. Spot: "Take Off: Why We Go"